We're pleased to announce that V1.1 of the Datamartist tool is now available, and we'd like to thank our customers and testers for all their feedback. Your suggestions and observations have helped us continue to improve the tool, and are a great motivation. Keep them coming! This version is fully backward compatible with all previous versions of Datamartist, and we encourage all our customers to upgrade. We're very happy to have added two more very significant database vendors to the natively supported list, and expect more in the future. In addition to adding the connectivity, we've also made enhancements to the general import interface, particularly in the selection and browsing of tables from large databases. Check it out. We are particularly proud of this block, because it gives a clean, clear visual view into one of the most important data analysis functions, the table join. 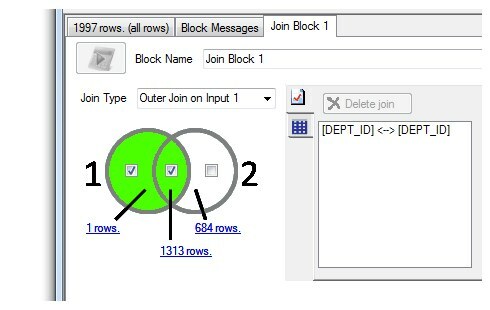 You can specify the scope of the join easily using the venn diagram, and can drill down into the various result sets and see whats joining and whats not. We've made almost all the data grids selectable and copy enabled, so you'll find that you can easily grab a value, a row, a columns, or any combination, copy it, and then paste it into Excel or other applications. We've been loving the flexibility this gives us, and hope you like it too. We're always looking for feedback from our users, so let us know what you think.